High-frequency trading: Better for the Investor? - EuroPacific Quant Research Group Inc.
• Over the past years, high-frequency trading has progressively gained a foothold in financial markets, enabled and driven by an interplay of legislative measures, increased competition between execution venues and significant advances in information technology. • The terms “algorithmic trading” and “high-frequency trading” are frequently mixed up in the public debate. In contrast to traditional trading strategies, high-frequency traders do not aim to establish and hold long-term positions. Rather, they enter into short-term positions and end the trading day “flat”, i.e. without carrying over significant positions to the next business day. Algorithmic trading strategies, on the other hand, typically aim at reducing the adverse market impact of large-sized, institutional orders. • Strategies employed by high-frequency traders are manifold: They may be differentiated into statistical arbitrage, liquidity detection and liquidity providing strategies (market-making). • Extraordinarily high-speed and sophisticated quantitative and algorithmic computer programs for generating, routing, and executing orders are of paramount importance for the financial success of high-frequency traders. • Existing evidence related to the impact of high-frequency trading on certain market quality and efficiency indicators is, as of now, inconclusive: while high-frequency traders provide liquidity to the market and contribute to the price formation process, some market participants feel themselves to be at a disadvantage by being unable to keep up with the necessary investments in trading technology. • In light of the growing importance of high-frequency trading and its allegedly harmful effects in the event of adverse market conditions, regulators are currently putting strong emphasis on subjecting high-frequency trading to prudential and organisational requirements and to supervision by a competent authority. High-frequency trading has been a focus of considerable public and regulatory attention since May 6, 2010, when financial markets were given a drastic wake-up call by what later became known as the Dow Jones “flash crash”. Although a subsequent investigation by the SEC cleared high-frequency traders of directly having caused the flash crash, what could be observed that day were the effects of the evolution of the financial markets and the interplay of regulation, competition and technology. This research briefing aims to shed light on the current developments in the financial markets, the repercussions of the flash crash and on the conclusions drawn by regulators. We will look at the pros and cons of high-frequency trading from an economic perspective and on the potential future prospects of this business model. Both in the US and in Europe, comprehensive pieces of legislation were passed in the years preceding the crisis (re-)regulating the securities markets. In Europe, the Markets in Financial Instruments Directive (MiFID) is the cornerstone of securities markets regulation. Applicable since November 2007, MiFID fosters greater competition in the provision of services to investors and between trading venues in order to contribute to deeper, more integrated and liquid financial markets. MiFID’s counterpart in the US is the Regulation National Market System (RegNMS) of 2005, designed to strengthen the regulatory structure of US equity markets. RegNMS fosters both competition among individual markets and competition among individual orders in order to promote efficient and fair price formation across securities markets. The so-called “Flash Crash” was a brief period of extreme market volatility on May 6, 2010. That day, the Dow Jones Industrial Average (DJIA) fell by 998.5 points within seconds, which marks the biggest one-day decline on an intraday basis in the history of DJIA stock index. At the same time, substantial developments in information technology (IT) have spurred an electronic revolution, enabling market participants’ remote access to multiple execution venues without the need for physical presence, which ultimately led to an “arms race” for the most effective deployment of IT. IT has also been used to increasingly automate the order-execution process. But why has this fostered the emergence of high-frequency trading? Breaking the monopoly of exchanges by ending the so-called “concentration rule” (in Europe) or by providing intermarket price priority for quotations (in the US) introduced more competition. Exchanges reacted to the increased competitive pressure by modifying their fee schedules, which not only meant a de facto reduction of fees for investors but also facilitated entirely new tariff structures. Pricing mechanisms such as maker-taker pricing1 contributed to a notable decrease in frictional costs for small trades. Over time, the employment of simple algorithms for straightforward order-execution tasks became standard procedure, which is evidenced by the drastic decrease in the average trade sizes on major stock exchanges over the last years: on the NYSE, for instance, the average trade size is now only 200 shares, down from 1,600 shares fifteen years ago; the average value of an order has fallen to USD 6,400 from USD 19,400 five years ago. In addition, the new tariff structures increasingly spurred the development of more sophisticated algorithms to work off more complex order management tasks. Beginning in the late 1990s, the electronification of execution venues enabled market participants (banks, brokers and their institutional and retail clients) to remotely access electronic order books. Electronic trading refers to the ability to transmit orders electronically as opposed to via telephone, mail, or in person. Since most orders in today’s financial markets are transmitted via computer networks, the term is rapidly becoming redundant. Algorithmic trading (AT) is more complex than electronic trading; it is an umbrella term which does not necessarily imply the aspect of speed typically connoted with HFT. 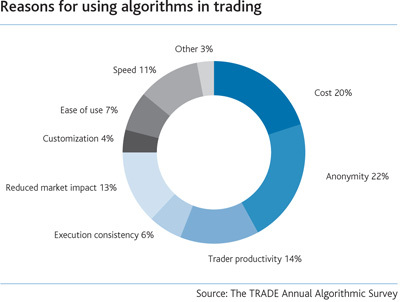 Algorithms were originally developed for use by the buy-side to manage orders and to reduce market impact by optimising trade execution once the buy-and-sell decisions had been made elsewhere. Hence, AT may be defined as electronic trading whose parameters are determined by strict adherence to a predetermined set of rules aimed at delivering specific execution outcomes. Algorithms typically determine the timing, price, quantity, and routing of orders, dynamically monitoring market conditions across different securities and trading venues, reducing market impact by optimally and sometimes randomly breaking large orders into smaller ones, and closely tracking benchmarks over the execution interval (Hendershott et al., 2010). High-frequency trading (HFT) is a subset of algorithmic trading where a large number of orders (which are usually fairly small in size) are sent into the market at high speed, with round-trip execution times measured in microseconds (Brogaard, 2010). Programs running on high-speed computers analyse massive amounts of market data, using sophisticated algorithms to exploit trading opportunities that may open up for milliseconds or seconds. Participants are constantly taking advantage of very small price imbalances; by doing that at a high rate of recurrence, they are able to generate sizeable profits. Typically, a high frequency trader would not hold a position open for more than a few seconds. Empirical evidence reveals that the average U.S. stock is held for 22 seconds. Over time, algorithms have continuously evolved: while initial first-generation algorithms – fairly simple in their goals and logic – were pure trade execution algos, second-generation algorithms – strategy implementation algos – have become much more sophisticated and are typically used to produce own trading signals which are then executed by trade execution algos. Third-generation algorithms include intelligent logic that learns from market activity and adjusts the trading strategy of the order based on what the algorithm perceives is happening in the market. HFT is not a strategy per se but rather a technologically more advanced method of implementing particular trading strategies. The objective of HFT strategies is to seek to benefit from market liquidity imbalances or other short-term pricing inefficiencies. Liquidity-providing strategies mimic the traditional role of market makers – but unlike traditional market makers, electronic market makers (liquidity providers) have no formal market making obligation. These strategies involve making a two-sided market aiming at profiting by earning the bid-ask spread. They have been facilitated by maker-taker pricing models and have evolved into what is known as Passive Rebate Arbitrage. As much of the liquidity provided by high frequency traders (HFTs) represents “opportunistic liquidity provision”2, the entering and exiting of large positions is made very difficult. Pursuing statistical arbitrage strategies, traders seek to correlate prices between securities and to profit from imbalances in those correlations. Subtypes of arbitrage strategies range from arbitrage between cross-border or domestic marketplaces to arbitrage between the various forms of a tradable index (future or the basket of underlying stocks) and so-called cross-asset pairs trading, i.e. arbitrage between a derivative and its underlying. In terms of liquidity detection, traders intend to decipher whether there are large orders existing in a matching engine by sending out small orders (“pinging”)to seek for large orders. When a small order is filled quickly, there is likely to be a large order behind it. High-frequency traders are mainly proprietary traders. This means they utilise their own capital for trading activities and do not usually conduct HFT on an agency basis. The use of extraordinarily high-speed and sophisticated quantitative and algorithmic computer programs for generating, routing, and executing orders is absolutely decisive. It requires speedy market data delivery from trading centre servers to the servers of the HFT firm; speedy decision processing in the HFT firm’s trading engines; speedy access to trading centre servers; and speedy order execution by the trading centres. Hence, an extremely low latency, which is defined as the time which passes between the entry of an order until it is executed and the transaction is processed, is vital for HFTs. Market operators offer speed-sensitive market participants the installation of their trading engines directly adjacent to their own infrastructure. This co-location of servers in close physical proximity to the market operator’s systems minimises network latencies3 between the matching engine of the trading venue and the servers of the market participants. Further characteristics of HFT firms include real-time data analysis in order to produce automatic trading decisions and very short time-frames for establishing and liquidating positions, resulting in the submission of numerous orders that are often cancelled shortly after submission (cancellation rates of greater than 80% are not uncommon). Moreover, HFT firms end the trading day “delta-neutral”, i.e. in as close to a flat position as possible without carrying significant, unhedged positions over-night. • HFs are under no affirmative market making obligation, i.e. they are not obliged to provide liquidity by consistently displaying high-quality, two-sided quotes. This may translate into a lack of available liquidity, in particular during volatile market conditions. • HFTs contribute little to market depth due to the marginal size of their quotes. This may result in larger orders having to transact with many small orders and may affect overall transaction costs. • HFT quotes are barely accessible due to the short duration for which the liquidity is available when orders are cancelled within milliseconds. Another interesting issue is whether HFT contributes to the price formation process on equities markets. In this context, Brogaard (2010) examines a large data set of HFT firms trading on Nasdaq and finds that, firstly, HFTs add substantially to the price formation process as they tend to follow a price reversal strategy (irrespective of whether they are supplying liquidity or demanding it), driven by order imbalances, and so tend to stabilise prices. Secondly, HFTs do not seem to systematically front-run4 non-HFTs. They provide the best bid and offer quotes for a significant portion of the trading day, but only around a quarter of the book depth (as do non-HFTs) and reduce their supply of liquidity only moderately as volatility increases. Thirdly, HFTs engage in a less diverse variety of strategies than non-HFTs, which may exacerbate market move-ments if HFTs use similar trading strategies. Fourthly, while in principle high cancellation rates could impact the smoothness of execution in markets where HFTs are present, prevailing narrow spreads seem to suggest that cancelled quotes are quickly replaced by other market participants. Hendershott and Riordan (2009) find that algorithmic traders’ quotes play a larger role in the price formation process than human quotes. Summing up, on the one hand, price discovery benefits from market participants who quickly detect anomalies in market prices and correct them. On the other hand, HFT may distort price formation if it creates an incentive for natural liquidity to shift into dark pools as a way of avoiding trans-acting with ever-decreasing order sizes. In terms of market volatility, neither Hendershott and Riordan (2009) nor Brogaard (2010) find any evidence for a detrimental impact of either AT or HFT. In the currently ongoing debate on how to regulate HFT, the question arises whether this practice collides with the economic functions of a financial market. Originally, the electronification of exchange trading led to a democratisation of this business: retail investors benefitted from equally quick access to markets as professionals and to lower transaction costs. Today, however, special arrangements such as co-location services to reduce latency or the provision of special trade data feeds give preference to the needs of HFTs. Unable to make similar investments in trading technology, other market participants raise concerns that they are at a disadvantage. They also fear that HFTs can execute orders and hit liquidity ahead of them. Moreover, (sub-penny) arbitrage, where HFTs buy and sell stock purely to collect rebates, is often criticised as bringing no value to the (retail/long-term) investor. These concerns seem to be partially justified: unlike registered market makers, HFTs have neither the obligation nor incentive to continue to provide liquidity to the market in the event of adverse market conditions. This means they are able to withdraw liquidity at any time. Yet, it must also be acknowledged that in normal market circumstances, HFTs do increasingly provide liquidity to the market (“artificial volume creation”) that would otherwise not be available, easing the pressure on supply and demand. In consequence, spreads have been narrowed (and are kept narrow), benefitting both retail and institutional investors. In view of these developments, the European Commission, in its review of the MiFID framework directive, intends to subject HFT to MiFID requirements and to supervision by a competent authority. The Commission proposes to make sure that all persons involved in HFT above a minimum quantitative threshold are obliged to be authorised as investment firms and would therefore be subject to full regulatory oversight and to a number of organisational prerequisites such as risk management obligations and capital requirements. In addition, the Commission intends to introduce amendments to MiFID related to the provision of liquidity by HFTs: According to these plans, operators of regulated markets would be required to ensure that a HFT firm continues to provide liquidity on an ongoing basis subject to conditions similar to those applicable to market makers, if it executes a significant number of trades in a certain instrument. In terms of order persistence and tick sizes, operators of regulated markets may be required to ensure that orders remain in the order book for a minimum period before being cancelled – or alternatively to ensure that the ratio of orders to transactions executed by any given participant would not exceed a specified level. Implementing measures could further specify minimum tick sizes that would generally apply to all trading, not just automated trading. The events around the May 6 flash crash have shown that equity markets may be vulnerable to strategies facilitated by the latest evolutions in trading technology. Hence, regulators both in the US and in the EU are reacting to this potential threat by subjecting HFTs, to the extent they are not already, to prudential and organisational requirements and to full regulatory oversight by a competent authority. The European proposals are closely related to those in the US, but are still – in the context of the MiFID review – in their early stages. Certain suggestions seem to be reasonable: One of them is the Commission’s suggestion to require that co-location facilities need to be offered on a non-discriminatory basis. This is sensible on the grounds of maintaining competitive neutrality, but may be difficult to put into reality, as physical capacity for co-location is naturally limited. Other proposals appear more problematic: For instance, the suggestion to require HFTs to provide liquidity on an ongoing basis may seem reassuring at first sight; however, it would expose market making firms to price risk in times of crashing markets, which would have an adverse rather than a positive impact on financial stability. Instead of imposing new obligations on market makers, a better way to help prevent market failures would be to implement a market-spanning framework of carefully designed safeguards (so-called volatility interruptions in the EU, circuit breakers in the US) which halt the market during market breakdowns, provide the opportunity for participants to cool down and to then re-open trading at new equilibrium prices. In addition, exchanges and other trading platforms could be required to test high-frequency and algorithmic trading programmes before they are used in the markets. Aldridge, I. (2010). High-Frequency Trading: A Practical Guide to Algorithmic Strategies and Trading Systems. John Wiley & Sons. Brogaard, J. (2010). High Frequency Trading and its Impact on Market quality. Northwestern University Kellogg School of Management Working Paper. September 2010. Hendershott, T., James, C.M., and A. Menkveld (2010). Does Algorithmic Trading Improve Liquidity? Journal of Finance. Hendershott, T., and R. Riordan (2009). Algorithmic trading and information. NET Institute Working Paper No. 09-08. Jovanovic, B., and A. Menkveld (2010). Middlemen in limit order markets. Working Paper. New York University. 2010. This entry was posted in Blog-News, Foreign Exchange Releases and tagged High Frequency Trading. Algorithm trading on February 10, 2014 by adavinci.